I just got this book in a few days ago… I have not even started reading it yet. But, as I was looking around the web this morning I came across this Blog at www.rethinkingyouthministry.com and a blog that was Posted by Brian Kirk. I’m even more intrested now to finish this book and write my thought on this subject….More on this in the coming days! 1) Churches seems overprotective (e.g. resist, demonize, and ignore real-world issues and problems). 3) Churches appear antagonistic to science. 4) Churches take an overly-simplistic or judgmental view of sexuality. 5) Youth struggle with exclusive claims of some Christian churches. 6) Youth sees the Church as unfriendly to those who doubt. Their findings suggest that churches ignore these issues at our own peril. Twenty years ago we could rely on youth leaving the church for a few years, then marrying, starting a family and coming back. This just isn’t the case anymore for most youth. Adolescence stretches into the mid-to-late twenties and many young people put off school, career, and family much longer. Additionally, the internet and social media are exposing young people to a vastly diverse world of ideas, religious beliefs, and culture. In other words, its a whole new ballgame. 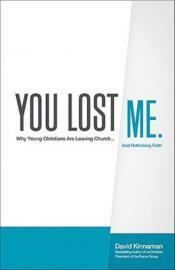 I’m currently reading Kinnaman’s latest book You Lost Me: Why Young Christians are Leaving the Church and Rethinking Faith. My review to follow soon. What Can Happen in 2 Hours of a Teens Life?